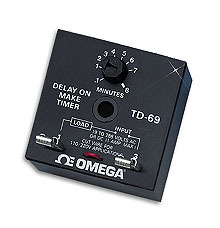 The OMEGA ® TD-69 and TD-73 timers are ideal for use when a time delay in energizing a circuit is required. The TD-69 is a delay-on-make timer, and the TD-73 is a delay-on-break timer. When power is applied to the TD-69, the adjustable delay period starts. The load is energized at the end of the delay period. When power is removed from the TD-73 (due to a thermostat, etc. ), the adjustable delay period starts. The load will remain de-energized until the delay period has ended. Typical applications for the TD-69 and TD-73 include: staging two or more high amperage starting loads (TD-69), preventing transient signals from activating high alarms (TD-69), preventing rapid re-starting after sudden power loss (TD-73) and use with thermostat controlled equipment (TD-73). Delay-on-break timer with 6 second to 5 minute adjustable delay. 19 to 288 volts ac only, 50/60 hz. Delay-on-make timer with 6 second to 8 minute adjustable delay. 19 to 288 volts ac or dc, 50/60 hz.